The ‘MapQuest-OSM’ tiles are a MapQuest styled variation on the OSM dataset. The tiles are distributed by the good folks at MapQuest who also distribute a set of OSM tiles called MapQuest Open Aerial with satellite imagery. 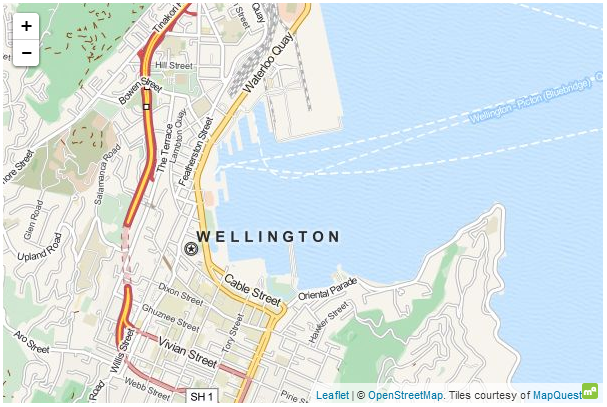 If using the MapQuest-OSM tiles, appropriate copyright attribution is required to OpenStreetMap. Additionally they ask that “Tiles Courtesy of MapQuest” be placed on the map along with their logo and a link from the ‘MapQuest’ portion that goes to ‘http://www.mapquest.com/’. This usage example is slightly more complex in that it involves a slightly different approach to including the subdomains. Leaflet will normally operate with subdomains of the form a, b and c, but in this example we find otile1, otile2, otile3 and otile4. To accommodate this the otile portion is included in the URL and the variable parts of the subdomain are declared in a separate option called subdomains.